Turkey's Islamist president, Recep Tayyip Erdoğan, appears as the sole person in his country's politics who knows what he wants. Erdoğan seeks absolute power and acts against all obstacles to his ambitions. He is eager to identify new "enemies" whose purported conspiracies he believes justify his harsh rule. Through the end of October and most of November, Erdoğan has carried out a spree of enhanced repressive measures. This latest onslaught reflects his current fixation on a referendum, proposed for spring 2017, to ratify or reject constitutional amendments that would provide a dramatic increase in his presidential powers. To hold the referendum, Erdoğan's Justice and Development Party (AKP) must first gain a parliamentary majority authorizing its placement on the national ballot. The party needs 330 legislative votes, out of 550, to permit the referendum. AKP won 317 deputies in the national elections of November 2015. AKP lacks the two-thirds majority, or 367 parliamentary seats, to allow immediate enactment of the constitutional changes. Erdoğan hopes to win a referendum next year to dramatically increase his presidential powers. Erdoğan is promised a coalition majority of 357 for a referendum by joining with the Nationalist Movement Party (MHP), which has 40 seats. MHP is an extremist party with a background of anti-secularist violence during the 1970s and anti-Kurdish agitation. From 2012 to 2015 the Turkish authorities conducted a "peace process" with the Turkish Kurds. Erdoğan sought backing from the Kurdish-dominated People's Democratic Party (HDP)—the third biggest force in the national legislature, with 59 deputies, after the November 2015 election—for his reinforcement of the presidency. When the HDP declined to support him, the ceasefire collapsed and fighting resumed in Turkey's Kurdish southeast. On November 4, HDP chairperson Selahattin Demirtaş was arrested, as noted by the Guardian, with at least 10 of his colleagues in the party's leadership. The HDP representatives' parliamentary immunity from prosecution was abolished this year. 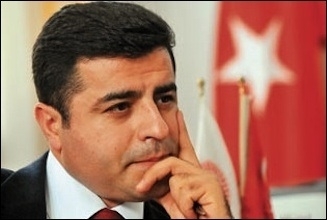 HDP Chairman Selahattin Demirtaş was arrested on November 4. According to Erdoğan's government, the HDP, as a Kurdish-interest party, is a front for the radical Kurdistan Workers Party (PKK). But as the London Independent pointed out, the HDP alleges they are under attack for "daring to oppose" the new presidential system. HDP chief Demirtaş had made defiance of the scheme a priority for his party, denouncing it as leading to a dictatorship. On November 17, the New York Times observed that the number of journalists arrested in Turkey since the coup attempt in July has reached 120. Of them, 10 were employed by Cumhuriyet (Republic), the country's leading newspaper and a pillar of the secular tradition known as "Kemalism" for Mustafa Kemal Atatürk, who modernized Turkey beginning in the 1920s. Cumhuriyet is the last independent media institution under Erdoğan's rule. At the end of October, the editor-in-chief of Cumhuriyet, Murat Sabuncu, was arrested with a group of his colleagues. On November 11, Cumhuriyet's chairman, Akin Atalay, was detained at Istanbul's Atatürk Airport. All are charged by Ankara with terrorism. The assault on Cumhuriyet, the favorite media of the secular elite, suggests that in the wake of the crackdown on the HDP, the Republican People's Party (CHP), which represents the Kemalist legacy in politics, will be a fresh target of Erdoğan's rage. Removal of parliamentary immunity for the HDP could be extended to the 134 CHP deputies. Turkey's ruling party filed a criminal complaint against CHP leader Kemal Kilicdaroglu on November 8. The CHP is an opposition party, but it has echoed the AKP in blaming the failed July coup on the followers of the Sufi preacher Fethullah Gülen, who lives in Pennsylvania. 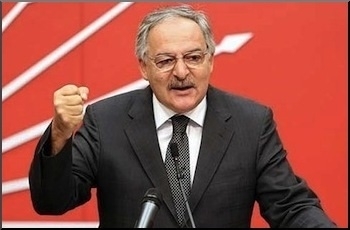 Yet already on November 8, Erdoğan and the AKP filed a criminal complaint against CHP head Kemal Kılıçdaroğlu and several CHP elected representatives for allegedly "insulting the president." The CHP luminaries had expressed concern about the consequences of Erdoğan's post-July state of emergency, which remains in effect. Erdoğan pursues his aims step by step while his critics merely repeat their familiar rhetoric. The opposition appears disoriented when their habits are compared with the tactical finesse of Erdogan and his capacity for opportunistic cooperation. The AKP's history is one of forming temporary coalitions, then turning against its partners in fulfillment of Erdoğan's whims. From 2002, when the AKP first assumed power, until 2013, the party maintained its most important alliance with the religious Gülen movement, in repudiation of the secularist tradition. But once the secular establishment had been curbed, Erdoğan turned on Gülen, declaring the exiled cleric and his followers to be "terrorists" in the wake of the July attempt against the regime. 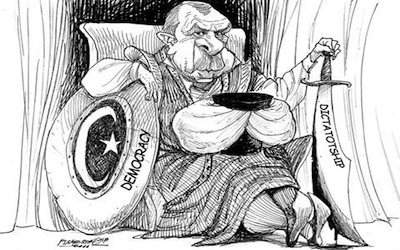 Erdoğan pursues his aims step by step while his critics merely repeat their familiar rhetoric. The anti-AKP forces seem incapable of an effective defense for the detained Kurdish parliamentarians and the journalists, to say nothing of the Gülenists. Since the July events, Erdoğan's regime has arrested some 37,000 people, fired or suspended 100,000 from government and academic employment, and shut down 170 media enterprises. Leading politicians in the European Union, for their part, have protested against the arrest of the HDP legislators and the Cumhuriyet journalists. Austrian federal chancellor Christian Kern, a Social Democrat, condemned Erdoğan in a Facebook post for leading Turkey "away from the European values of democracy, the rule of law, and human rights." Kern called on the EU to stop financial assistance to Turkey under an agreement to halt migrants from using the country as a platform for illegal entry to the European mainland. Erdoğan, according to the state Anadolu news agency on November 6, repeated his argument that the HDP is merely a political tool of the PKK. "If you [the HDP MPs] act like a terrorist instead of a lawmaker then you are treated like terrorists... I'm clear. I have no worries about these international attacks. Only the nation matters to me," he thundered. He went on to charge that "Europe recognizes the PKK as a terrorist group but acts as an accessory to them." Turkish minister for EU affairs Ömer Çelik defended the mass arrests in his country. He asserted that the Gülen movement are "more dangerous than Nazis." But other prominent EU figures have applied the Nazi comparison to Erdoğan's regime, rather than to his opponents. As reported by Deutsche Welle on November 7, Luxembourg foreign minister Jean Asselborn has said of the Turkish government actions, "To put it bluntly, these are methods that were used during the Nazi era." In response, Çelik repeated the Erdoğan line, saying "The Nazis are like apprentices when compared with Gülenist terror organizations." Stephen Schwartz, a fellow at the Middle East Forum, is executive director of the Center for Islamic Pluralism in Washington, DC. Veli Sirin is European director of the Center for Islamic Pluralism.